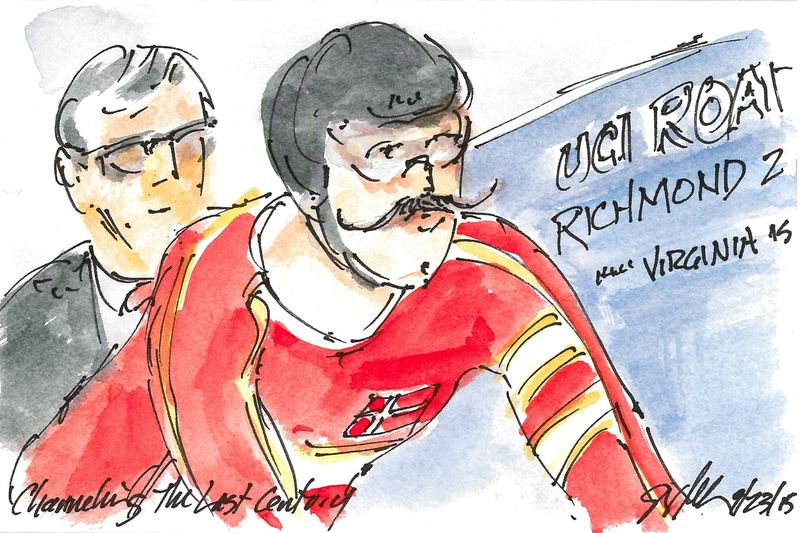 Richmond 2015 UCI Worlds: Of Course! Sine the announcement of the course for the Richmond 2015 UCI World Road Racing Championships, I have been telling anyone who will listen that Peter Sagan would win. It is so much fun to get it right. I'm sure Sagan feels much the same way. Although he had to work very, very hard to make it happen. Sagan didn't have a big team to support him or chase down breaks so he had to ride a smart race. When the second to the last break went with such a strong group of riders including the current and a former World Champion I was worried. I literally had not seen Sagan all day (which can be a very good thing in a long bike race) and now he had missed what looked to be the decisive move. But know, he trusted the desire and ability of others to chase down the escapees. Then he had the brains to wait until the short very steep climb up the 23rd Street cobbles. He used his descending skills to push out enough of a lead that he could hold them all the way up (and there was a bit of steep up) to the line. It was wonderful to watch him be congratulated by virtually every rider in the peloton. I don't think a single rider begrudged him his victory. Perhaps now Oleg Tinkoff will shut up.... I doubt it. This is a small original watercolor and ink painting that was created using Yarka St. Petersburg watercolors and Steve Quiller brushes from www.richesonart.com. The works were done live in the middle of the Fanfest area across from the awards podium as the racing was going on. Prints and the originals will be available before very long at www.richmond.com (the website of the Richmond Times Dispatch newspaper). 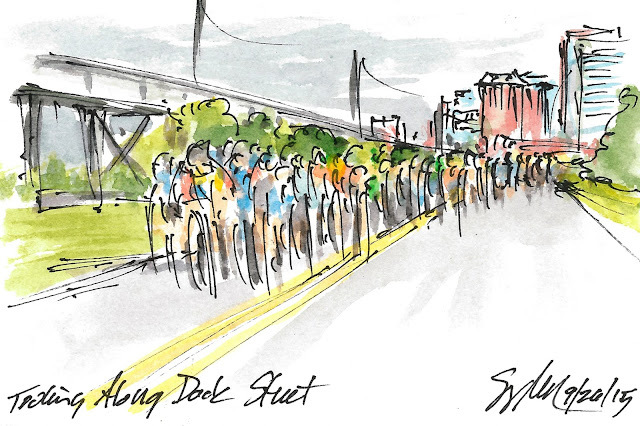 I was no less excited than everyone watching on the roads of Richmond, across the world on the television or in the Convention Center with me, to watch Peter Sagan make his move stick up the final climb of Governor's Street and along the berserk cycling fans lining the false flat to the line. So excited with his victory that I neither signed not title this painting. I was surprised to not see one of Sagan's creative and jubilant victory salutes. He had plenty of time to celebrate the moment leaving the rest of the charging peloton 3 seconds down the road. Perhaps is 6 second place finishes in the Tour de France had left him wanting to make sure the victory was his before he celebrated. Everyone expected the final ascent of 23rd Street to be the deciding moment of the race. Everyone. But just because it is expected doesn't mean it can be countered. 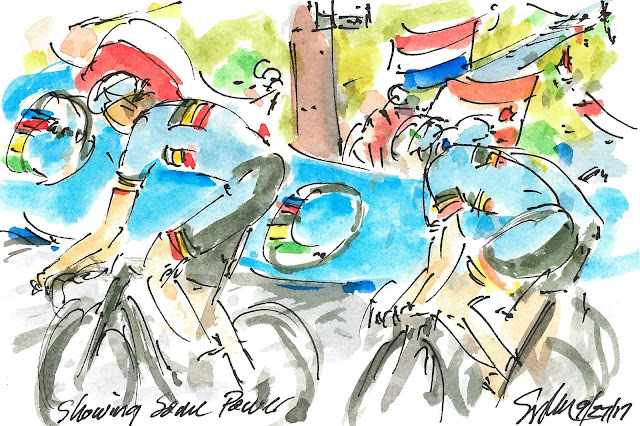 It was Tom Boonen who launched just at the base of the climb, quickly passing the fading Tyler Farrar (USA) who had attacked back at Monument Avenue. Again listening to the crowd in the Convention Center as I painted, they would roar with delight everytime Farrar rolled to the front of Kanstantsin Siutsou (Belarus). They attempt was foiled on the first of the final three climbs. 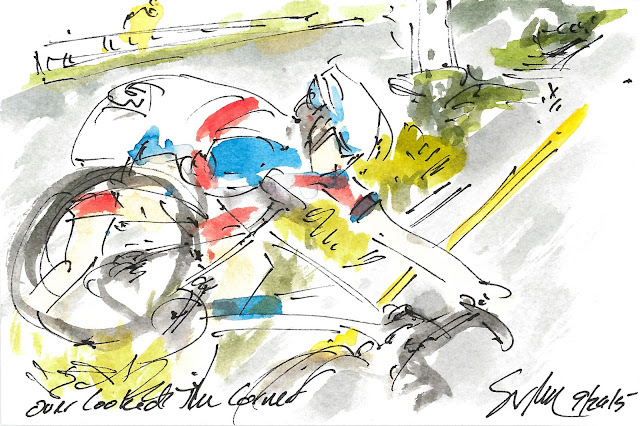 But it was the mutli-talented Peter Sagan (Slovakia) who had the legs and the power to counter Boonen's attack. Sagan is a brilliant descender, so this move could be the move that wins the Jersey! With less than two laps to go and a break up the road without a German teammate in it, Andre Greipel went to the front to chase it down. The break had some really strong men in it including the about to be former World Champion, Michael Kwiatkowski (assuming he doesn't stay away), Elia Vivianni (Italy), Daniel Moreno (Spain), and of course the three that started the move, Bauke Mollema (Netherlands), Tom Boonen (Belgium), and Ian Stannard (UK). The flat sections off of Monument Avenue through the campus of Virginia Commonwealth University, plus the down hill section of downtown to the river was well suited for the strengths of the big German sprinter. I guess we now know that the team is working for John Degenkolb. Tucked right onto the wheel of the big German is the American Tyler Farrar, another sprinter playing the roll of super domestique. The American team missed the power move as well. 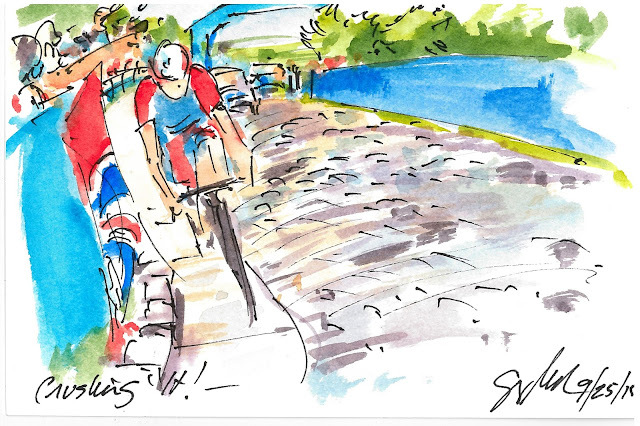 With this the third to last trip up the 18% wall of 23rd Street, Ian Stannard (UK) jumped out of the greatly reduced peloton attempting to make the early (perhaps too early) move. Bauke Mollema is the Dutch rider was the one to respond in hopes of joining the Brit to create the upset escape. The Elite peloton is far to crafty to let a move like this one succeed, plus this is the hill everyone expects to be where the attacks will occur. The road use to have an asphalt strip that ran up the center of the climb, but felt it necessary to "improve" the road by returning it to its original Belgium Cobble surface. Keeping an eye on the duo and then going after them was Tom Boonen. "Tom Frites" as he is nicknames throughout Europe seemed to be very confident of his own chances for the podium today. As they head back out onto the flat section of the course two of the Spanish riders slip off of the front. It wasn't much of a move and riders from Germany, Belgium and Holland quickly brought them back into the fold. I'm unsure who these two are but I am quite confident that Alejandro Valverde was not the Movistar rider on the front of the duo. 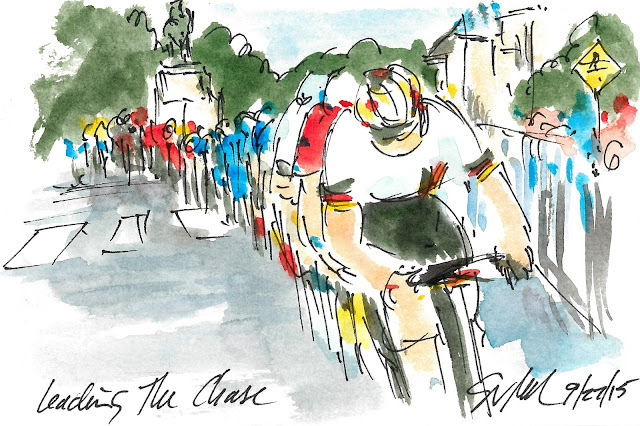 With the three climbs that come in rapid succession at the end of the laps, it seems unlikely that an attack on the flats has much chance of success. 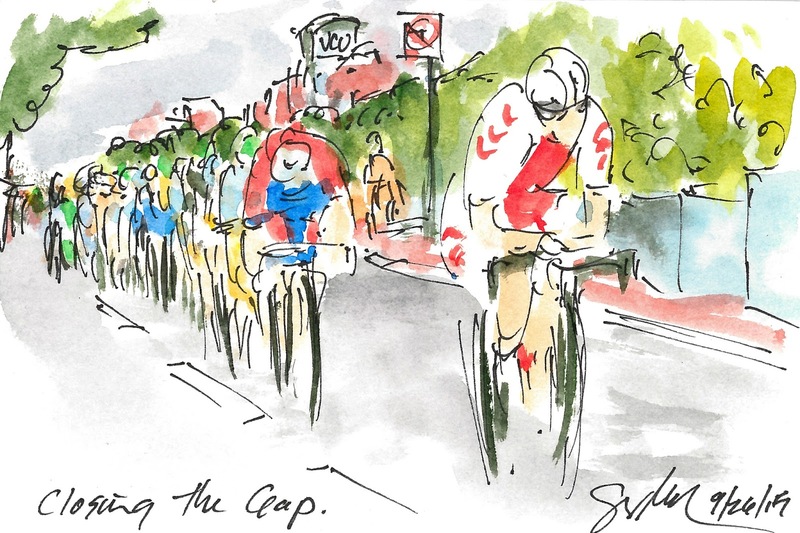 As the riders head up Monument Avenue, if the gap is less than two minutes the break is visible as they come back down the avenue. As I said earlier, the Belgium team was litter with amazingly strong riders. They went to the front of the peloton as the group swung onto the cobbles of Libby Hill yet again driving the pace to shuck as many sprinters as they could. 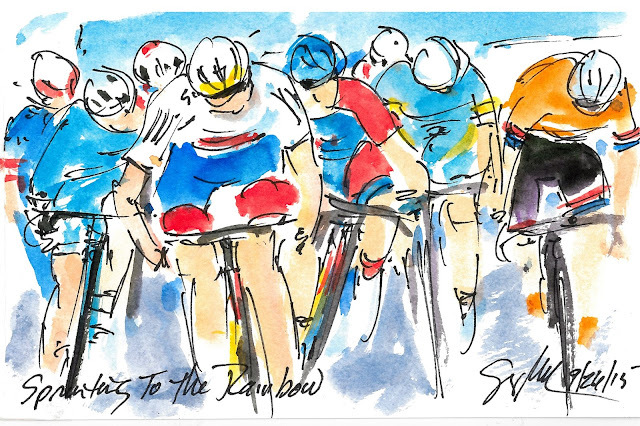 Sprinters are notoriously bad climbers, so this course implies that it wasn't going to be a sprinter pulling on a Rainbow Jersey at the end of the day. Many of the roads in Belgium mirror the steep cobbled climbs of Richmond. Although I suppose that it was Richmond that was mirroring Belgium. One would deduce that this was a race for the long legs of Tom Boonen, and he was the one leading the team up the climb on this lap. I suspect that he hope to intimidate his rivals into submission. I quickly lost count of how many laps the peloton had made, but I never lost sight of just how strong these men are. 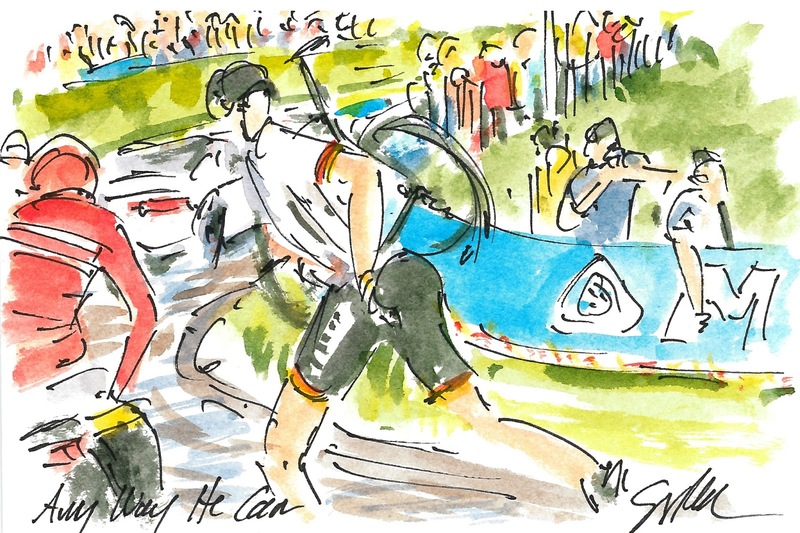 As the German lead peloton crested the cobbles of Libby Hill, Tony Martin swung his head around to make sure he still had the two German sprinters, John Degenkolb and Andre Greipel. 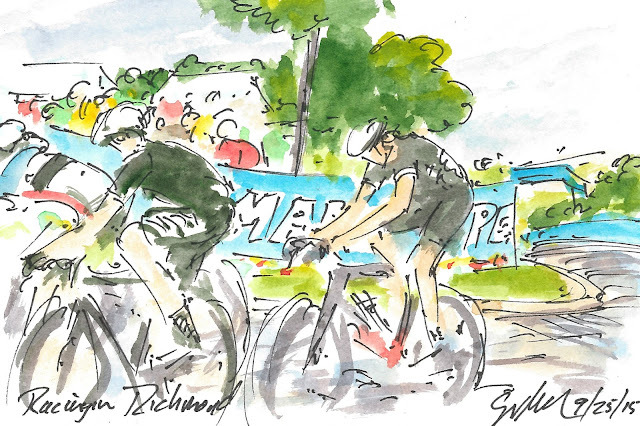 It should be interesting to see who the team has designated for the sprint, the duo spent the Tour de France contesting all of the sprint stages against each other. Degenkolb rides for Giant Alpecin and Greipel for Lotto Soudal. The Germans had brought an incredible strong group of riders to Richmond, and the fans were thrilled to see them. Since I was painting all of these works publicly, Bettina Martin was sitting next to me watching as I painted this of her son. Needless to say, she left Richmond with the original and a number of prints in her suitcase. Plus, she is an incredible kind and charming woman. The early break away of seven riders that included /Richmonder, Ben King, worked well together, each one rolling through, taking their turn on the front of the group. Some how, every time they came pass the finishing line fans, King was the one at the front of the group. Those who did not quite get the finer details of racing would roar their delight at seeing him "leading" the race. Along with King, Dunne, Sergent and Alzate, the riders in the break were Andriy Khripta (Ukraine), Park Sung Baek (Korea) and Yauheni Hutarovich (Belarus). 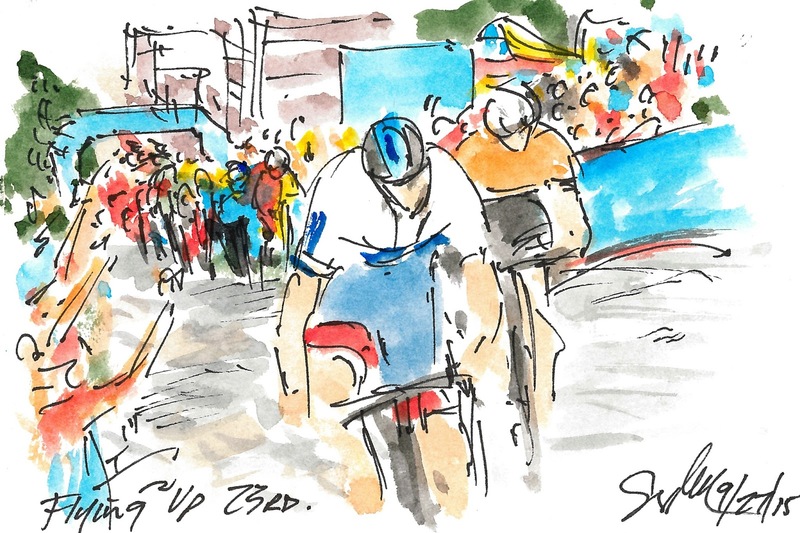 The climbs quickly claimed their first victim as Ivan Serbic (Serbia) wasn't able to hold onto the front group up the short steep cobbled ascent of 23rd Street. Tom Boonen (Belgium) had a flat tire as the peloton approached the Libby Hill cobbles for the second of the 15 times up to the high point of Church Hill and of the course. Boonen, ever the professional, was calm as he slipped back into the convoy of following team vehicles. He knew that it was extremely early in the race and he would have no trouble getting back into the fold. Boonen is one of two former World Champions on the Belgium team that are on course for the final race of Richmond 2015 UCI World Road Racing Championships. 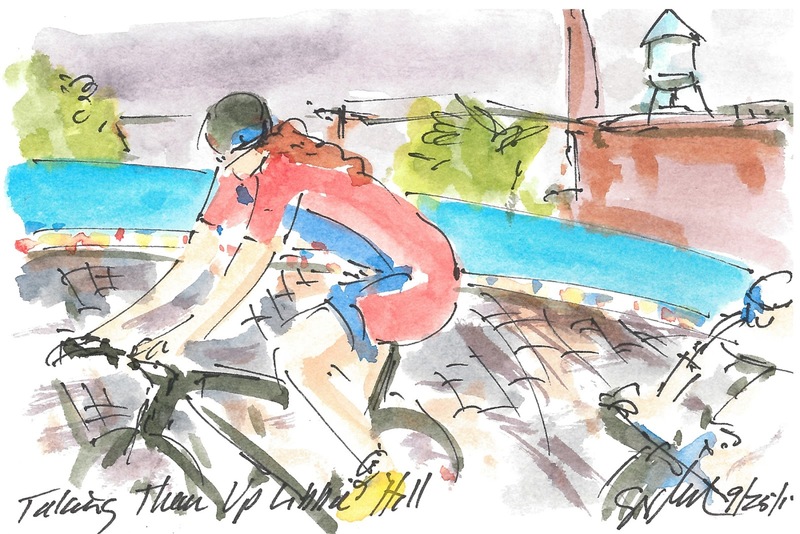 There was a lot of chatter about how flat and easy the Richmond 2015 course was when it was announced, but the peloton changed its tune the first time they road up Libby Hill, 23rd Street and Governor's Street in race conditions. 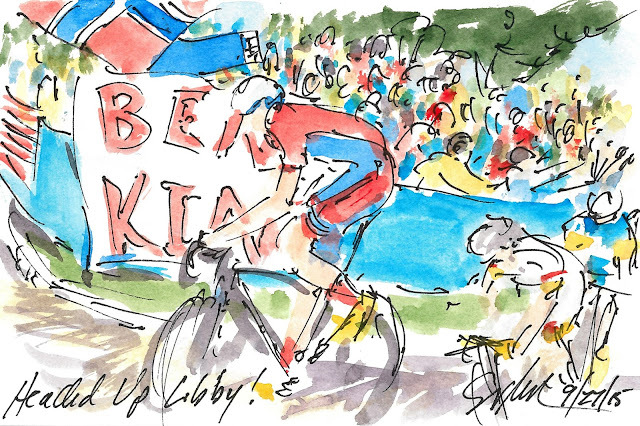 The only man in the peloton who had grown up with the course was Ben King (USA) and his local fans made sure to scream their support as he climbed the Libby Hill on the lead in the first lap of the day. Many non-cycling fans asked me if the riders had let King ride out on the front. First he was out there for over 100 kilometers, so "letting" didn't enter into it. But the question reminded me of Jens Voigt's response to a question about being allowed a solo lap of the Champs Elysees in his final Tour de France, "In cycling nothing is given, it must be earned." Ben King worked hard to have the honor of leading the entire Elite Men's field through his hometown of Richmond, Virginia. King was followed up the climb by Carlos Alzate (Colombia) and then the rest of their break away companions. They were surrounded by thousands of screaming fans and the crowd would keep growing as the race progressed. It had to be an unbelievable day for American Ben King, he is racing on the very roads that he grew up on in Richmond, VA. I'm sorry, but how cool is that? Every kid dreams of playing in the big game, but getting to fulfill it is something altogether different. While it wasn't going to be the move that won the day, King went early with a nice size group comprised of Jesse Sergent (New Zealand), Conor Dunne (Ireland) amongst others. The Richmond fans were thrilled to see their hometown boy out on course as much as four minutes ahead of the peloton. 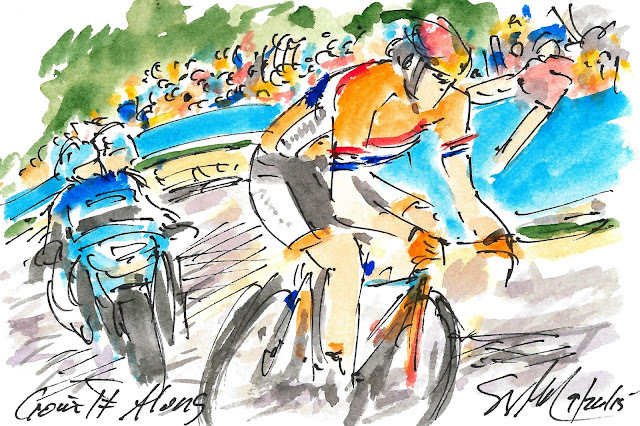 Lizzie Armistead (UK) raced a brilliant final kilometer to win the coveted Rainbow Jersey in the Women's Elite Road Race. She lead the group of eight up the final climb and then sat on the front bringing the pace to a crawl. It was as if she was daring the other women to try and out sprint her. The only one who took the challenge was the winner of the second La Course race on the Champs Elysees, Anna Van Den Breggen. The Dutch woman got the jump on the Brit, but didn't have the legs to sustain the effort on the false flat to the line. Armistead turned her legs to claim the victory on the line by not much more than half of a bike. Van Den Breggen held on for Silver and the fast closing Megan Guarimier (USA) grabbed the last step on the podium. Those who missed out on the sprint were Elisa Longo Borghini (Italy) 4th, Emma Johansson (Sweden) 5th, Pauline Ferrand Prevot (France) 6th and Katarzyna Niewradonna (Poland) 7th. This is an original small watercolor and ink painting that was created using Yarka St. Petersburg watercolors and Steve Quiller brushes from www.richesonart.com. 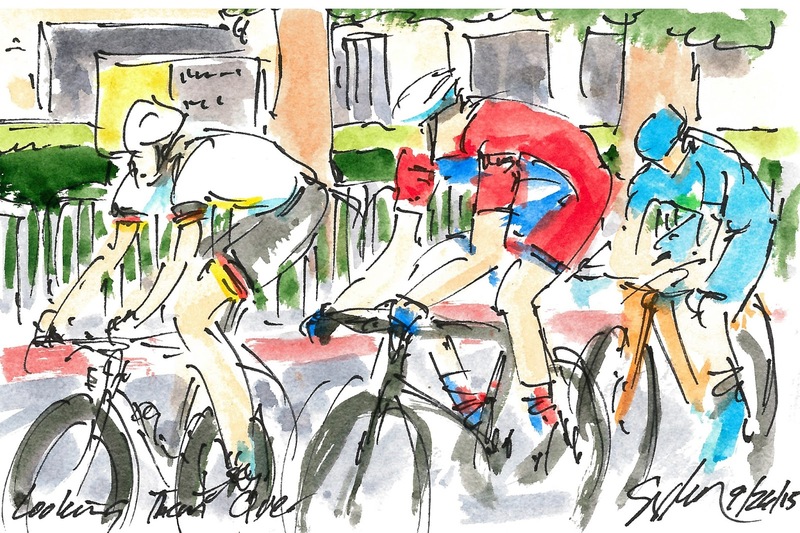 These paintings are created live while watching the races through a feed provided by the Richmond 2015 Worlds organization. For two more days, you will be able to watch me create the works live at the Fanfest area at 5th and Marshall Streets near the finish line. You can also purchase either the originals or one of two different sizes of prints while you are there, or later at www.richmond.com. 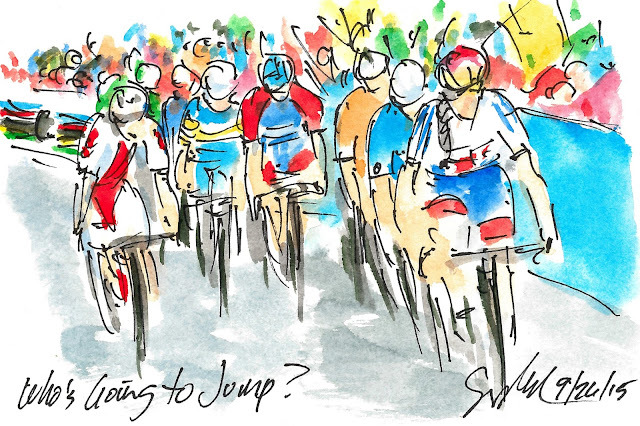 Richmond 2015 UCI Worlds: Who's Going to Jump? The powerful Lizzie Armistead (UK) lead this group of eight up the final climb of the race. As they rounded the corner onto the finishing straight it seemed that the entire octet was going to come to a complete standstill. It was beginning to look more like a track race than the end of a 130 kilometer road race. 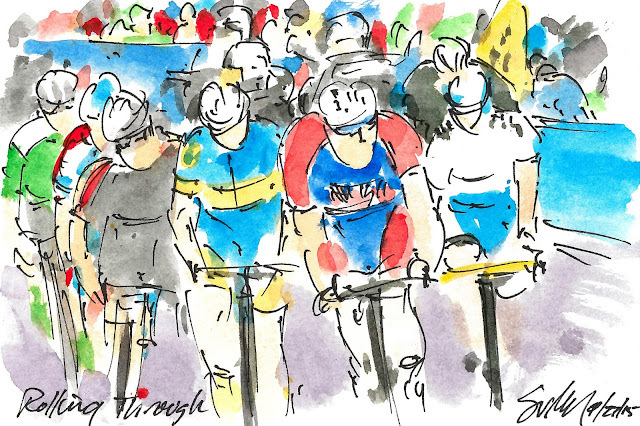 Each rider was looking at her adversaries trying to see who was about to launch her sprint. Armistead was in the least favorable position trying to see who was going to open up the sprint for the line. Following the ongoing aggression of the Dutch women it was Anna Van Der Breggen who made the first move. On the penultimate ascent of Libbie Hill, it was the American Coryn Rivera who lead the thinning peloton up the cobbles. She was matched by the Italian Valentina Scandolara, Elisa Longo Borghini (Italy) with Katarzyna Niewradonna (Poland) trying to hold the climbing carbon wheel. The atmosphere on the hillside was electric as the starts of women's cycling ascended to Chruchhill yet another time. The Dutch team has been pushing the pace of the race around every lap. With every attack there was a Dutch woman ready to drive the pace to pull the escapee back. 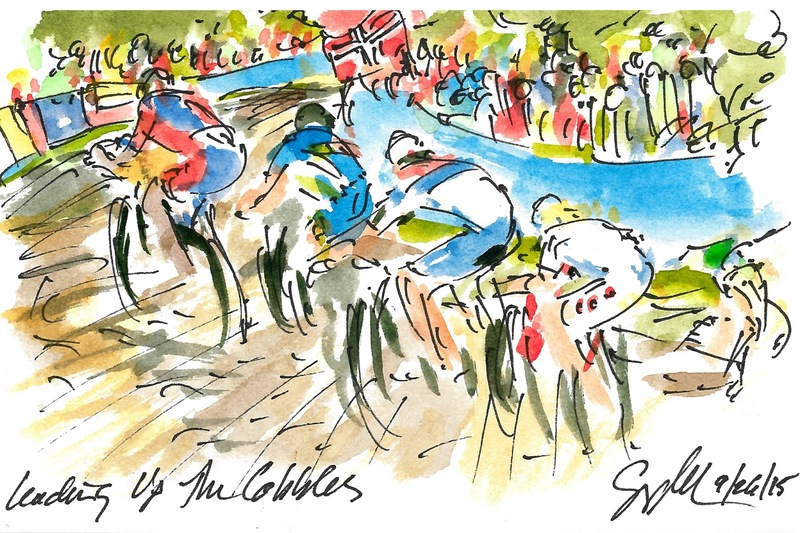 When it was Chantel Blaak's (Netherlands) time she jumped away on the ascent of the twisting cobbles of Libbie Hill. Just so you all know, this is not a road that is ever open to traffic it is merely for us fool hardy cyclists to scale. With the roads much dryer than was feared as we all went to bed last night, there were far fewer crashes than had been feared. Poor Paola Munoz (Chile) just plan overcooked the corner swinging back on to Broad Street. She ran out of road surface and fell into the attractive plantings along the median of the road. While the plants may have been soft, the bricks that line the planting beds certainly is not. Fortuantely, Munoz quickly grabbed her bicycle and jumped back into the race. This is no sport for the feign of heart, one has to be willing to take quite a bit of pain to succeed. Shortly after the riders pass through the start finish line they come to the feed zone. This is were riders can be passed drinks (often with energy gels attached) and on a designated lap be given a musette filled with food to sustain the athletic effort they are undertaking. 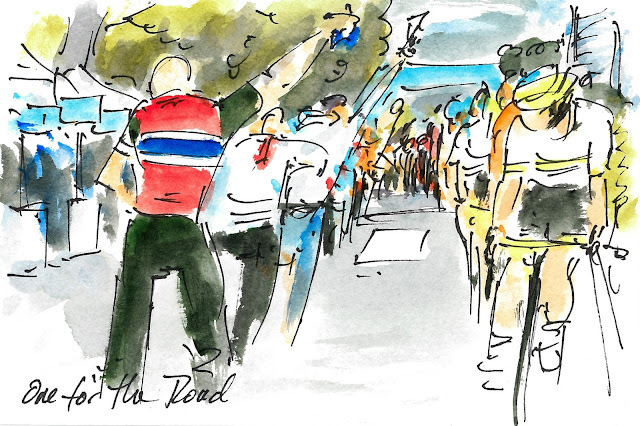 The Australian Katrin Garfoot looks over her shoulder realizing she missed her soigneur about eight guys back. She needn't worry, it will only be about 25 minutes before she can try again. No sooner than Monika Zur (Poland) had been pulled back than another rider went on the offensive. The team most often on the attack was Australia, this time is was their rider, Katrin Garfoot, who was lighting it up. As the laps continued to tick by the big names were starting to pay attention to the moves (or at least have one of their teammates monitor the front end of the race). The peloton was in no mood to let anyone escape although there was attack after attack. This time it was Monika Zur (Poland) who was reeled back in by the American lead peloton. At this point the group was headed back down Broad Street after their loop around the Monuments and the campus of Virginia Commonwealth University. I remember when the tower on the Seigel Center was built, I never thought I would see it being broadcast around the world. VCU is where I studied to refine my art education and start the process of becoming a professional artist. Richmond 2015 UCI Worlds: Am I Away? After the first trip up Libbie Hill it was the Russian, Svetlana Vasilieva, who took advantage of the steep descent and off camber corners to ride everyone off of her wheel. 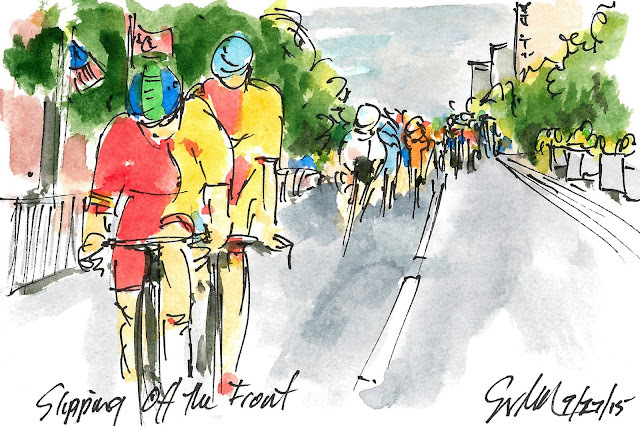 She glances back over her shoulder to see if the peloton was going to let her go. I will assume that in just two blocks she was going to turn right and hit the short 18% climb up 23rd Street. I think that those behind figured she would be quickly back in the pack by the top of the rise. They were right. The Elite Women know a bit more about what it takes to win a race that covers just under 130 kilometers, step one, don't waste energy. The peloton tooled around the flatter sections of the 16.2 k course. At this point they are on the flat Dock Street closing in on the sharp left hander that will lead them up to the cobbles of the now infamous Libbie Hill. Over their collective shoulders towers the high rises of downtown Richmond, VA and two their right are the elevated train trestles of the main north/south eastern railroad lines. It is fun to realize that these champions of the sport are riding down roads that I ride nearly every week. The pace they are seemingly coasting along at would be me riding flat out. I found this piece of video on twitter of another one of the German riders attempting to make the best of a bad situation. He apparently had a mechanical at the bottom of the cobbled climb of Libbie Hill. A rider must have his (or her) bicycle with them to advance on the course, so rather than waste time standing on the side of the road awaiting neutral service, he shouldered his machine and ran up the hill. I guess he figured the service mechanics would get to him eventually. His progress was monitored by the race marshal clad in red leather and astride a motorcycle. For the record Felix Gall (Austria) took first followed by Clement Betouigt-Suire (France) and Rasmus Pedersen (Denmark) rounded out the podium. With the light drizzle falling, the wet roads were a bit slick. But it is the painted strips that can be treacherous on a skinny high pressure racing tire. The German eased off his speed as he crested the summit of the Governor's Street hill so he didn't slide out on the cross walk stripes. Tucked on to his wheel was one of the three riders from Ecuador hoping to escape from those laboring up the climb behind. Without the ability to see their bib numbers nor hear the more informed commentators I simply don't know who these riders are. Sorry, I try to name everyone I paint. I am thrilled to see such talented athletes compete and to be inspired to create art from their herculean efforts. Without television coverage of the Junior races it has been quite a challenge to get imagery to work from. Fortunately, I have some very kind friends in the Richmond cycling community who messaged me their photographs since they were out on the course. This is the peloton chasing the now five man break back up Broad Street and the old CFB Bank building that stands as the lone high rise blocks away from the financial district the marks a typical downtown city area. I need to figure out what flag this one is, one of seemingly hundreds of international flags being waved enthusiastically all along the course. The riders and fans alike faced light rain for most of the day, but thankfully, the expected down pours held of while the young men were on course. With the cobbles and technical nature of the course, rain would have been disastrous. This is a small original watercolor and ink painting that was created using Yarka St. Petersburg watercolors and Steve Quiller brushes from www.richesonart.com. The works are being created live at the main Fanfest area near the finish line in full view of fans and cyclists alike (although not those out on course). The originals and two sizes of prints are available for purchase at Fanfest and later will be on offer at www.richmond.com. The order of the previous painting was flipped when the trio hit the line. 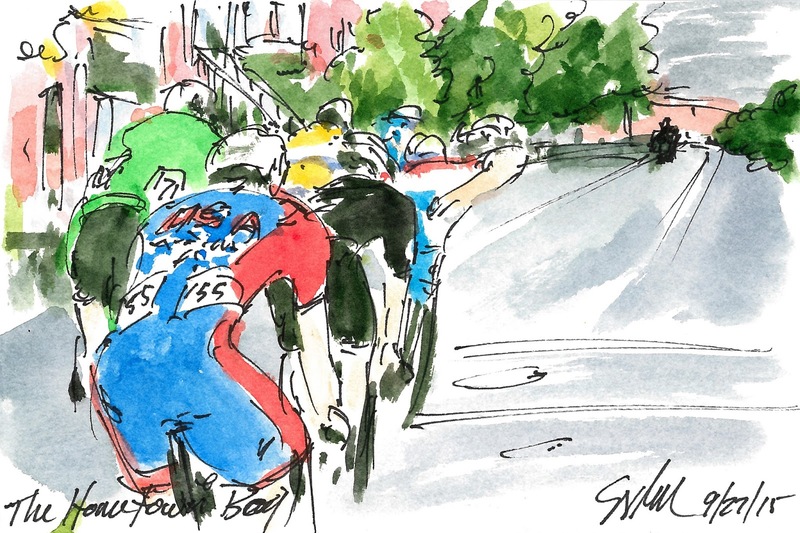 Kevin Ledonis had countered his teammates move on the final cobbled climb up 23rd Street leaving both Simone Consonni (Italy) and his countryman, Anthony Turgis (France) behind. 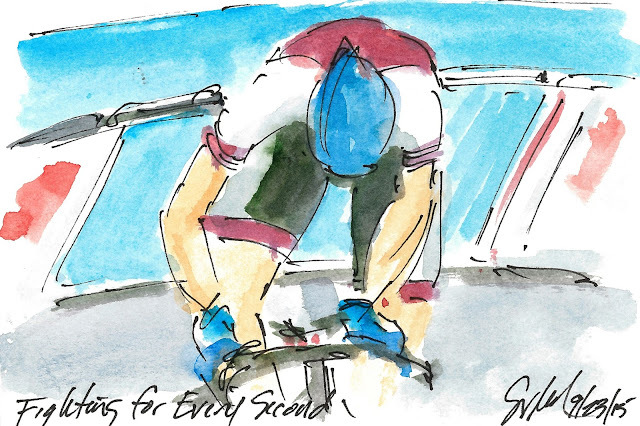 Ledonis put everything he had into getting up the final climb up to the finishing false flat straight to the line. 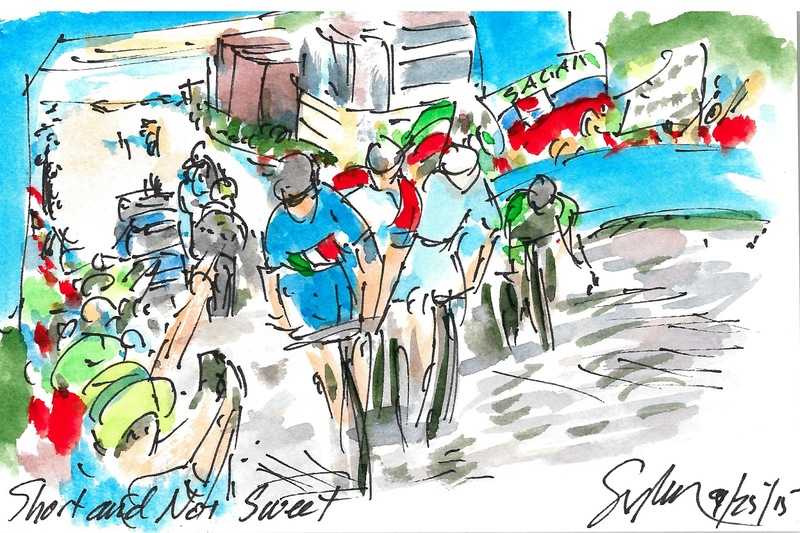 As he faded from the effort with the finish line in site the entire crowd in the Fanfest held their collective breaths as the Italian chased from behind. Stuck to Consonni's wheel was Turgis ready to bounce (if he could) should the Italian get to his fading compatriot. In the end it was Ledonis who attempted to raise his arms in victory, but he struggled with his bike just as he had struggled to hold off the charging Italian. While the cast of the breakaway may keep changing the break itself was stubbornly refusing to be caught. Just like it happens in a big Pro Tour race, it was up to the teams with a sprinter to come to the front and chase down the break. Even though the British team didn't have Mark Cavendish to work for, they still hit the front in hopes of reeling in the escapees. The U23 Men's Road Race always had a breakaway up the road, but the cast seemed to continual alter. The big German, Maximillian Schachmann, used his time trialing skills to bridge across to the remaining duo on the front of the Kazakh, Oleg Zemlyakov and the original breakaway member, Jose Luis Rodriquez of Chile. Schachmann brought some much needed power to the effort just as the trio hit the flatest section of the course. If the cobbles up to the summit of Libbie Hill were not enough for the U23 Men, they got to drop down off of Church Hill only to climb back up 23rd Street. This climb was just recently resurfaced with new cobbles that replace an asphalt strip that went up the center of the roadway. The ascent was less that 500 meters but at 18% it was enough to sap the legs of most any rider. The four to hit it ahead of the peloton were led up the rise by the Italian Davide Martinelli. He was watched closely by Jose Luis Rodriguez (Chile), Oleg Zemlyakov (Kazakhstan) and the struggling Irishman, Eddie Dunbar. 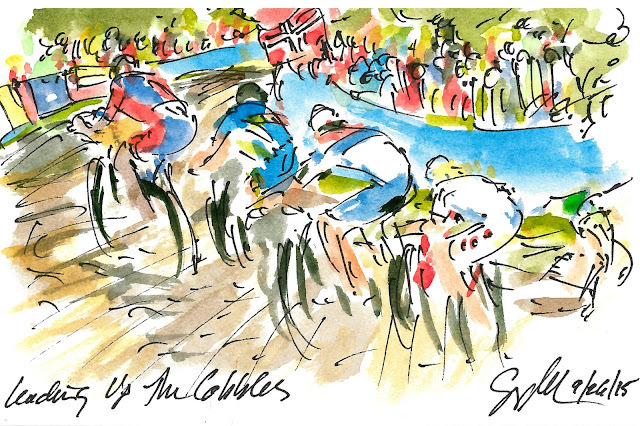 The peloton swung off of the main road and started up the cobbled climb of Libbie Hill. As they made the turn, they passed under the arch announcing where they were. It seems ironic to me that the climb appeared to be sponsored by Virginia Tourism. Their slogan is "Virginia Is for Lovers." I am quite sure that most of the peloton wasn't feeling any love for the roadway beneath there wheels, nor how many times they were going to have to pass under the "lover's sign"
I was tickled that the original of this painting was bought before I had even finished the line work part of the process. But then it is a pretty strong image that tells the story of the days racing. With the technical nature of the road race course, it was unwise to hang out at the back of the peloton. Due to the constant cornering or the three short step climbs, radical changes of speed were bound to lead to a touch of wheels and a tumble on the tarmac. It was Miles Scotson (Australia) who caused the small pile up at the back of the pack. Most riders like Fabian Lienhard (Swiss) remained upright it was one of the Romanians who joined the Aussie sitting on the road way. Fortunately, everybody was able to get back underway. 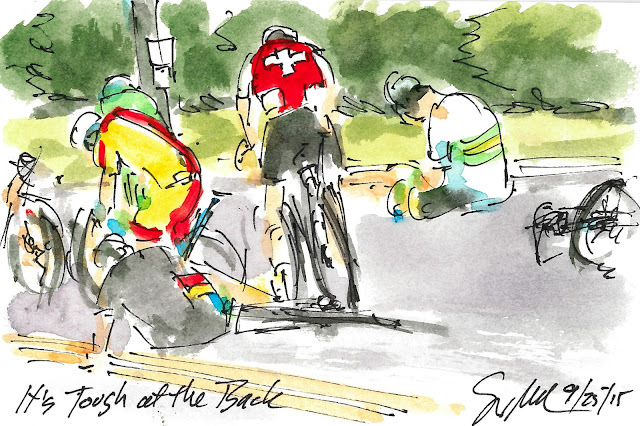 With the wreck coming so early in the race, all were able to rejoin the peloton but at what cost? The original break of three changed members and grew with only Jose Luis Rodriguez of Chile left from the first attackers. Now it is a Colombian, Jhonatan Restrepo tacked onto the back of Eddie Dunbar's wheel, proceed by Gregory Daniel (Team USA). Leading them all around the statue to Robert E Lee is the Kazakhstan, Oleg Zemlyakov. Much was made of the wrong-ness of keeping the statues to those who fought on the side of the American Civil War that was pro-slavery. But then if one removes all evidence of their history, they are doomed to repeat it. With a long day in the saddle ahead of them, the peloton didn't exactly storm off of the line. But there is always someone who wants to go out and look for some early glory. After all, the break away almost never works out, but then there is that one time where it pays huge dividends. Perhaps the Rwandan rider was looking for a chance to show his colors (I think it is Jean Bosco Insengiyumva), The African was quickly joined in the effort by Omer Goldstein (Israel) and Jose Luis Rodriquez (Chile). The trio would soon become a carrot for others who dreamed of a surprise victory. Daniel Hoelgaard (Norway) had a difficult start of this U23 Road Race. While lined up waiting for the start of the race, he discovered that his front tire was flat. He quickly headed back to his team mechanic for a quick wheel chain. As his man was kneeling to replace the wheel, the neutral service mechanic came running up with a front wheel as well. Hoelgaard was able to get back up to the start area before the race began, so I guess it was a case of "No harm, no foul". But I feel like it may have been an omen of what was to come for his team. Norway riders had more flats and a mechanical in the course of the race, and never seemed to be a factor on the day. The title of this painting says it all. Leapfrogging off of the efforts of her teammate, Emma White, Chloe Dygert (Team USA) crushed it on the final scaling of the first of the cobbled climbs. 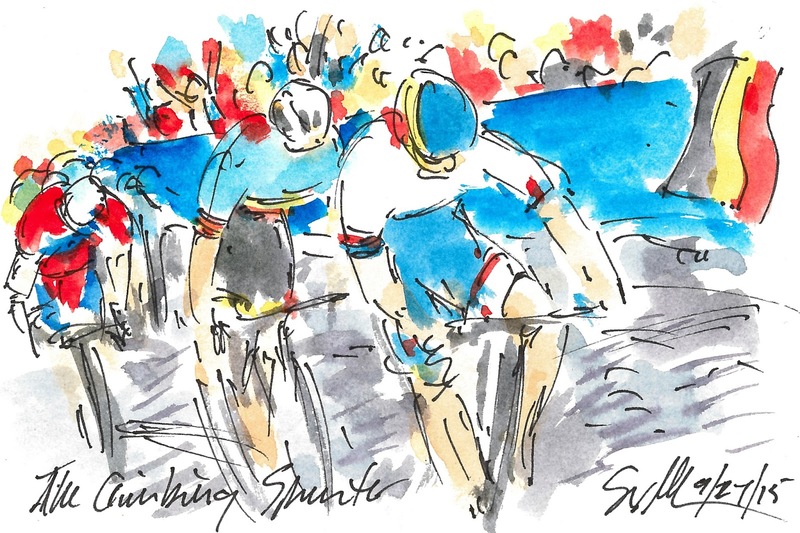 Dygert was wise enough to use her solo break to find the smoother gutter of the climb saving the charging cobbles, the risk of a puncture or even a fall on the uneven surface. It was clear with 5 kilometers left to race, no one was going to catch the gold medalist from the individual time trial earlier this week. And no one did! The tandem repeated their first and second in the ITT in the same order, each earning another of their respective medals. The climb up the cobbles of Libbie Hill was billed as the place to be for all of the weekend's road races. It absolutely lived up to its billing. Tacked on to the back of the peloton were young women from Sweden, the USA, Denmark, Switzerland and Italy, not that other team members were spread around the group. Fortunately for the Women's Junior race, the fear rains held off and most negotiated the treacherous roads without incident. The Junior Women's Road Race was the first race of the road racing section of the UCI World Road Racing Championships. The course featured some Belgium style cobble climbs, one up Libbie Hill to the top of Church Hill and the second even steeper one up 23rd Street back up to Church Hill again. The racing took in one more climb before the finishing line, but at least the asphalt was as smooth as silk by comparison. Emma White (Team USA) was the first to attack on the first lap up the much feared Libbie Hill. White had taken the Silver medal earlier in the week in her class's Individual Time Trial. I am elated to say that she garnered silver again at the finish line 7 laps later. Adriano Malori (Italy) found the final climb and the false flat a bit much but still managed to sprint across the line in first place with just four riders left on the road behind him. The odds said he had a chance for the podium. It would only take roughly another six minutes to discover which step would be his. Behind him on the road were some pretty big names including a former hour record holder, Rohan Denni, Tony Martin and Tom Dumolin. Then there was the very strong riding of Vasil Kiryienka. As it turned out, only Kiryienka was able to best his time, and then by only 9 seconds after over an hour of effort. The average time for the winner, Kiryienka was over 52 kilometers per hour. Of course that means the Italian Malori claimed the silver medal for the Richmond 2015 UCI World Road Racing Champions. This is a small original watercolor and ink painting that was created using Yarka St. Petersburg watercolors and Steve Quiller brushes from www.richesonart.com. In addition this painting is available along with two different sizes of prints in the Richmond Convention Center just a block away from the finish line of every race of the UCI World Road Racing Championships. Just come look for me directly across from the awards podium. Plus you can find a live stream of my painting the works at www.richmond.com were the paintings will soon be available for purchase. 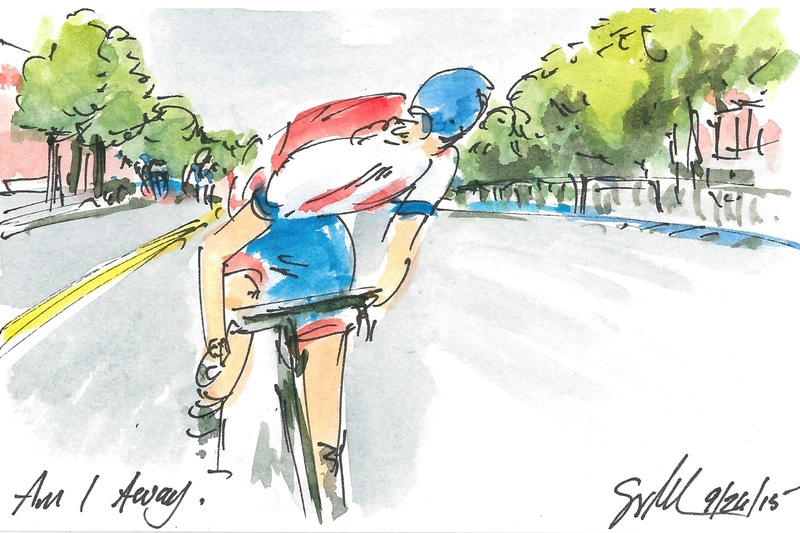 Richmond 2015 UCI Worlds: Looking for Speed! 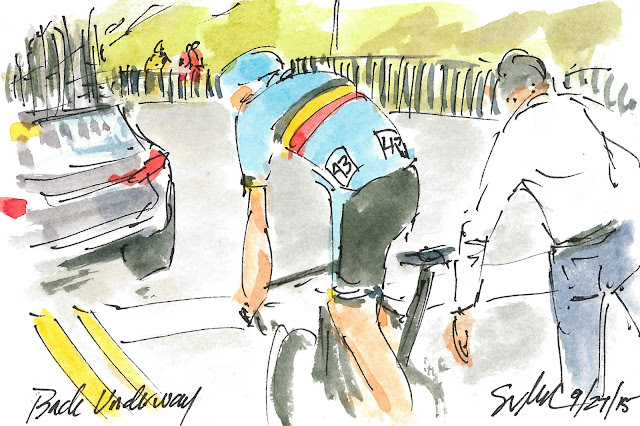 The three time former World Time Trial Champion, Tony Martin, was the odds on favorite for the day, but almost from the start it didn't seem like it was going to be his day. I talked with a friend and journalist who had been at the pre-race press conference who said that he seem nervous and unfocused, like he knew he wasn't on his top form. It was only two months ago when he crashed out of the Tour de France while wearing the Maillot Jaune. Yet another new friend pointed out that Tony Martin was going through surgery when most riders were well into training for the Worlds. 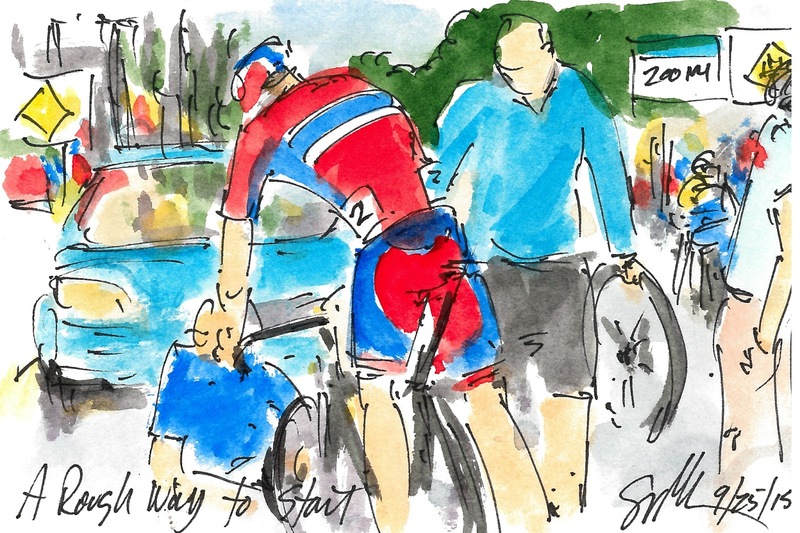 By the end of the day, Martin had dropped all of the way down to 7th place, not the result he or most of the cycling fans around the world were hoping for. Vasil Kirylenka (Belarus) has been a strong hard worker for Team Sky for both of Chris Froome's victories. It is often Kirylenka's stern visage that can be seen setting the pace like an unfaltering metronome for whomever is the designated team leader. It was powerful watching the strong man from Belarus riding for himself and setting the best time at every time check out on the course. If he was able to sustain the pace, he was ensured a spot on the podium. To dream of holding off the two very strong Tony Martin and Tom Dumolin, was a bit of a stretch, but with the ride Kirylenka was doing, it could happen. When Kirylenka reached the line, he set the new best time just three seconds ahead of the Italian, Adriano Malori, so it was now just a question of which step of the podium he would stand on. For the record, it was the top step in the end. Chapeay, Kirylenka! I was surprise to see that Stefan Kueng (Switzerland) was caught just meters from the finish line by the Polish rider, Maciej Bodnar. Bodnar had left the start house a minute and a half behind the Swiss, but caught him at almost 33 miles later. While it was a brave ride by Bodnar his effort only managed to secure him a spot in the top ten finishing just a little over a minute behind the eventually race winner. The Frenchman, Jerome Coppel, was the next rider to post the best times along the course. Coppel was not one of the riders that was on my radar to put in a strong ride, but then, what do I know? 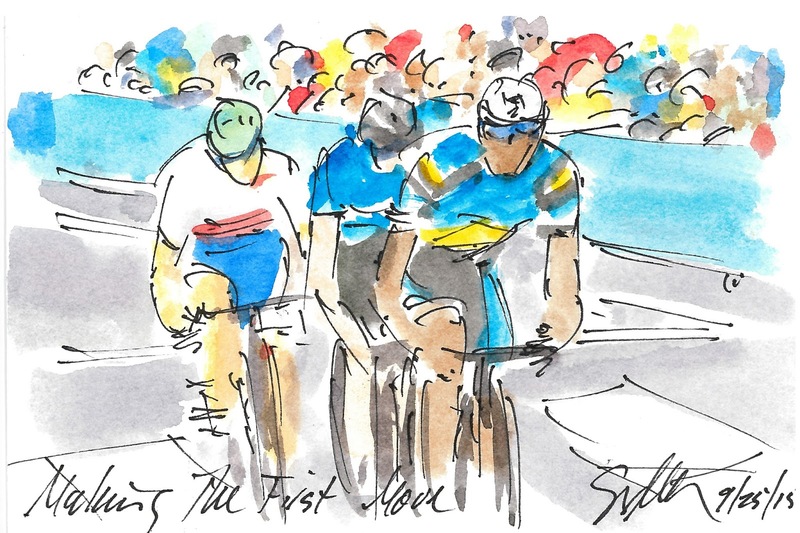 However, when Coppel reached the false flat rising to the finish line, he pushed enough on the pedals to be the next to claim the top chair in the leader's holding area. As he rolled into the hall, I yelled "Chapeau!" his head turned in my direction and smiled. I don't think he expected to hear "hat" called out in Virginia. Further still I had the chance to congratulate him on what became his bronze medal on the day. It is truly amazing how much access fans have with the heroes of the sport. Taylor Phinney, the USA's best hope for a medal in the Men's Elite Individual Time Trial, rode along the wide highway looking for the skyline of the city. So far the only variation in the bucolic landscape was the tinges of red in the early fall foliage. Phiney was the best place American on the day, but that place turned out to be 12th, not that his finial placing diminished the esteem of the provincial crowd. It was an unbelievable thrill to see riders like Luis Leon Sanchez (Spain) ride down stretches of road that I am all to familiar with. I'm not saying that I like to ride on 301, way to much fast moving heavy traffic, but the road goes out to a theatre that I have done work for over the last thirty years. Sanchez is about to ride past a lovely large pond that sits on the county line before the riders hit the city limits. After days of swinging through the city streets of Richmond, Virginia, under rather grey skies, it was a pleasure to see the rolling country side and the bright sunlight of a beautiful autumn afternoon. Luke Durbridge (Australia) was riding along one of the major older highways that run along the eastern edge of the United States from Florida to Maine. Durbridge is a strong powerful rider who's strengh has earned him the nickname, "Turbo Durbo." The Latvian rider, Aleksejs Saramotins, sprinted as hard as he could in a desperate attempt to gain the top seat in the waiting area. He came up 55 seconds short of the leader's time, but it was still enough to slide him into the current second place. A placing that slowly slipped away as the big names of the sport began to arrive at the finish line. Ultimately he dropped all of the way down to 39th overall. While Rasmus Christian Quaade (Denmark) was sporting facial hair from the early days of cycling, neither his kit nor his bike bared any similarity to those of those bygone days. I must admit that I sport a very similar 'stache but then I am not competing in a world class time trial. It is not the most aerodynamic facial adornment. Quaade was the first to change the leader board on the other end of his effort. 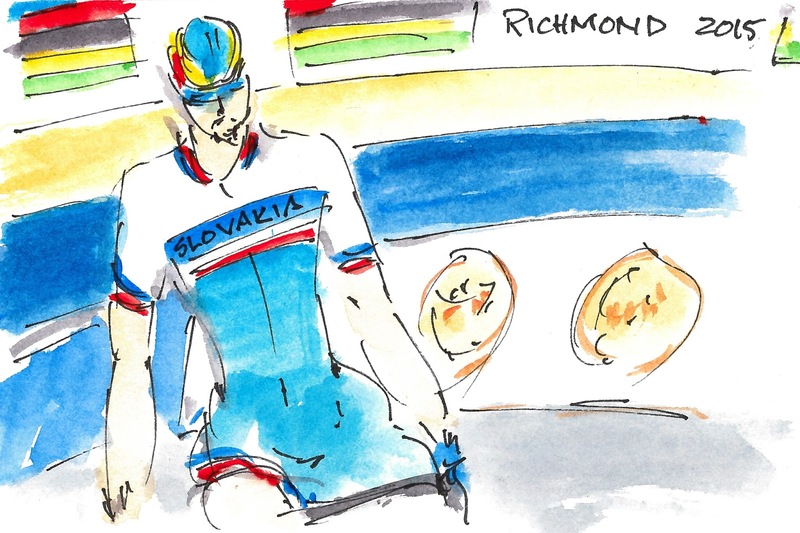 Richmond 2015 UCI Worlds: Here We Go! Richmond 2015 UCI Worlds: Are We All Here?